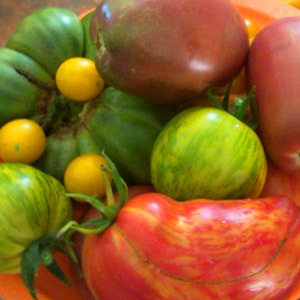 Love a fresh tomato off the vine…nothing tastes as good. No matter what else I have grown or where I’ve lived, I have planted tomatoes since I was a teenager. I await eagerly until that first tomato is ripe and ready to eat. There is no such things as too many tomatoes! Last year I roasted and froze the excess (instead of making sauce). They are wonderful. The concentrated flavor adds a really good taste to almost everything AND you can put them in salads, too. You will have to follow up with recipes later in the season!